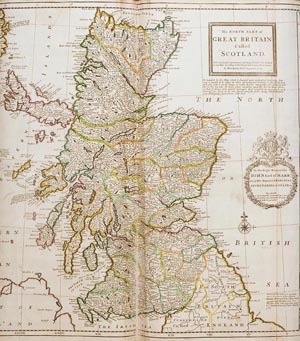 This 1714 map by the Dutch cartographer Herman Moll is an early and striking example of the intellectual and cultural repackaging of Scotland as the northern region of the new Great Britain. The work was dedicated to the Secretary of State for Scotland, John Erskine, earl of Mar, who had helped to steer the Union through the Scottish parliament. It is ironic that a year after the publication of this map, Mar led the 1715 Jacobite revolt. The new political and economic relationship with England affected Scotland in a number of practical and symbolic ways. The immediate impact of the Union ranged from complex arrangements for the adoption of English currency in Scotland to proclamations ordering the suppression of anti-Union demonstrations in Glasgow, Edinburgh and Dumfries. In late 1706 crowds in Dumfries were observed "insolently Burning, in the face of the Sun and the presence of the Magistrats, the Articles of Treaty betwixt our two Kingdoms". An official clampdown was ordered through proclamations posted to mercat crosses throughout Scotland outlawing all "Tumultuary and Irregular Meetings". Though the outcome of the 1707 Union is usually viewed in terms of elite politics, its influence was soon felt in everyday life. Even the way in which Scots measured their food and drink changed, with the introduction of English weights and measures in an effort to standardise and regulate the economy. The Union altered Scotland in other more subtle ways. Though the country retained many of its pre-existing intellectual, economic and religious links with continental Europe, the kingdom was increasingly influenced by English trends. The country was also re-interpreted in geographic terms as 'North Britain'.